Product #17385 | SKU LP36173 | 0.0 (no ratings yet) Thanks for your rating! 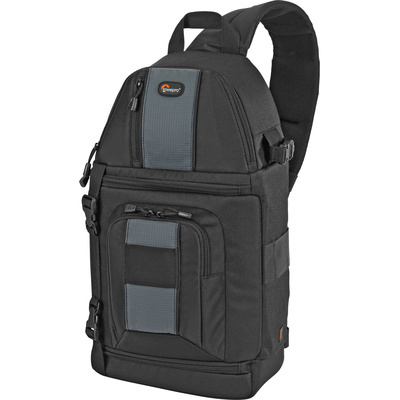 The Lowepro SlingShot 202 AW Camera Bag (Black) is designed to carry a D-SLR camera (without grip) with attached standard zoom lens 3-4 additional lenses or flash units, accessories (including a point & shoot camera), compact tripod or monopod and personal items. It is made from 600 denier polyester with 1680 denier ballistic nylon and a 210 denier nylon lining. There is a fully padded main camera compartment with an updated divider system that accommodates the camera gear and an upper compartment for personal items. It has 2 built-in memory card pockets on the inside lid of the main compartment. The bag also has a Hideaway Tripod Mount system, an All Weather AW Cover and 3 SlipLock attachment loops. It is carried by an attached, ergonomic sling strap that's designed to be worn over the right-side shoulder; it offers a comfortable way to carry gear and allows quick rotation from back to front.